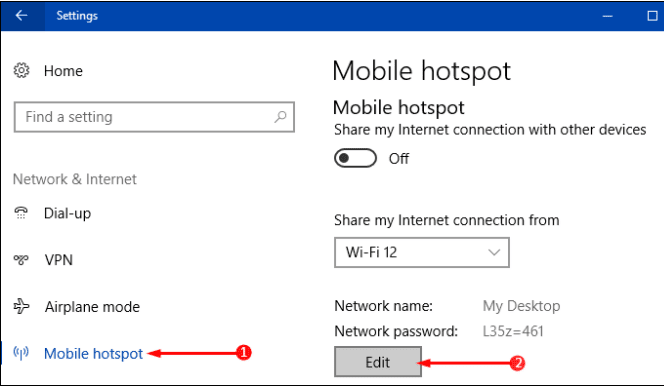 In case you wish to give yourself an additional layer of safety to the data, it is a good idea to Edit Network Name, Password for Mobile Hotspot. Usually, these network details are delicate as they are very vulnerable and can be easily tampered. Therefore, whenever in a public place it is always advisable to edit the hotspot details. It is not that Windows 10 sets a weak password. It comprises of letters and numbers but at the same time, the OS also provides an option to edit the password and name. Generally, all the user have different reasons to modify Network Name, Password for Mobile Hotspot.